O'er the horizon, I see good things yet! Trance is just one of those genres that you can either love to death or scorn with a passion. Hallowed by thy name, repetitive be thy nature. I personally enjoy the genre very much, and so I can find pleasure in its many intricacies. 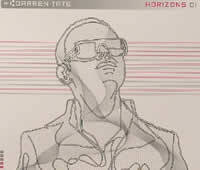 And what UK-born producer Darren Tate has provided in his album "Horizons 01" is indeed an intricate journey into what trance is all about: euphoric highs and dancefloor crowding beats. Prior to the release of this album, his "Horizons 01 EP" was released for DJs to spin, and the feedback was amazingly positive! And now (okay, a while ago) the full CD album is available for the public to listen to in their bedrooms or boudoirs! So one question remains: how does the music stack up in this crazy world of trance? The first track, Now We Are Free, utilizes the opera-style vocal talent of Shena McSwee, employing the same vocals as first heard in the movie "The Gladiator". This is a forceful trance version of the gladiator theme which begins the album on excellent ground. Strong synths give this track a euphoric and almost symphonic overtone that compliments the vocals very well. Build-ups are very quick; there is no gradual elevation of tension here. Instead, the song boosts itself in strong bursts, as though it is stepping up a flight of stairs. This is quite an enjoyable track, and should be considered one of the highlights of the album. Following this is the title track, Horizons, which feels more like a back-to-basics affair. It's a more simplistic track with a simplistic uplifting melody and a simplistic bassline/synth combination. I'd call it simplistic! Don't get me wrong: it's still a strong-sounding track, but certainly not one to clamor over. Venus is one tune that had DJs talking. For whatever reason, it seemed to strike a chord with toe-tappers across the globe. It is indeed a powerful trance anthem, boasting sharp synth jabs and a cosmic atmosphere, "Venus" is not one to be messed with. The song is very rich in sound, and only lets up around the halfway point to lead into an even more full-sounding version of itself! As Nintendo advertisements once boasted, "Now you're playing with power!" Such is the case with this track, and it should not be ignored when you drop this CD into your player. After the rush that is "Venus", there are some wild tribal beats that lead you to the next destination in sound: Nocturnal Creatures. As a collaboration with fellow trance producer Jono Grant, this track boasts the same amount of power and drive as the previous one, but feels slightly Amazonian! It could be the occasional distorted male vocal in the background; it doesn't say anything specific, but they are still crying out for you! The tribal beats still will haunt you, as the crazy reverb on them add a hollow acoustic presence. The next track, Dawn, although still pumpin' in nature, holds back a little in the energy department, instead offering a slightly more relaxed state of trance. This song features a more laidback style with typical euphoric trance synths and rolling waves of arpeggiations as a means of calming down the listeners before another blast of musical strength hits them in All That I Am. This is the only track with full vocals, provided by Roxanne Wilde, who had worked with Darren Tate on previous occasions. "All That I Am" is another shining star on this album, and certainly not a track to be missed. This actually ranks rather highly among all the various vocal trance ditties I've heard over the years. The strong synths heard in previous songs have made their way here in powerful bursts, but the focus is often on the vocals themselves, but the instrumental aspect creates a good balance, and combines for a superb outpouring of musical bliss. Don't skip over this one! Let The Light Shine In follows up that vocal trance bomb. This song is one of the most famous and popular Darren Tate productions of all (although it is also another collaboration with Jono Grant), but I've never really figured out why. Granted, it's a nice track to listen to, what with its padded synths and squelchy main melody and all, but it's certainly a track that I tend to forget quickly. You, trance listener, might fall in love with this track, but it just doesn't hook me like some of the other tracks do. However, the next one might open a few eyes. Deliverance takes the general delirium of all the previous songs on the album and pushes it aside in exchange for a more tech-trance style that might come as a surprise to faithful Darren Tate fans. Of primary concern is the bass synth which bears a darker tone than anything heard on the album so far, yet "Deliverance" still bears the signature Darren Tate sound. Certainly worth a listen. The following track, Now Is The Time (a collaboration with another popular trance producer, Mike Koglin), is also different from the rest, as it feels more like straightforward anthem trance than one might expect. This song would not be out of place on one of those standard German trance compilations where every song sounds as cheesy as the next. Whether you like it or not, that's your business. It's a fair enough track, but it still falls a bit short of the album's standards. Then in a surprising hook-up with the relatively unknown group Blue Amazon, the Other Love takes the vocals from the classic Blue Amazon tune "No Other Love" (and I say classic without really meaning it) and injects it with a solid instrumental trance flavour. The music is typical Darren Tate fare, but the vocals are catchy enough to push this tune forward as something definitely worth a listen. But perhaps one of the best songs on this album has been saved for last: Prayer For A God. Certainly being hailed (by me) as a wicked floorfiller, this song starts out sounding like a modern rave tune, only to slow down and break into a completely new trance tune featuring angelic vocals by Swati Natekar, an Indian world music vocalist. These vocals alone could sell the song: they are so enchanting, even if there are no lyrics, just the gentle flow of the voice. And over the vocals, the synths build into a menacing arrangement of layers; this could very well be considered as the climax of the album. This track cannot (I repeat, CANNOT) be ignored! It is, in my opinion, the best track of the album, and deserves any and all praise it gets. What a way to end with on a high note!